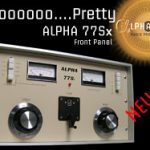 It’s true that Alpha amplifiers are amazingly robust, can continuously output legal limit power for an absurd amount of time and darn near last forever; however there are few sure things in life and when it comes to purchasing used equipment this is doubly true. Here at Alpha we believe that you should be able to purchase a used Alpha with some degree of assurance that it’s in proper working order; to aid in this endeavor we’d like to introduce our new Alpha Certified Used Amplifier Service. You wouldn’t buy a used vehicle sight unseen, so why would you purchase something as significant and expensive as an amplifier without having it inspected. Before you purchase a used amp and have it shipped half way across the country, have our techs run through our detailed pre-purchase inspection process and issue you a report on the amplifier’s health, fitness and output power. If there are problems with the amp we’ll let you know. Even what seems like the smallest burn on a band switch can end up costing you hundreds of dollar in parts and labor. It always amazes us how many amps that were sold in “perfect working condition” mysteriously become non-functional when received by their new owners. Don’t be one of those unfortunate souls, have us check over the amp you’re getting such a “great deal” on, before you commit – find out how good a deal you’re really getting! The fee for this service varies depending on the vintage and model of amplifier. Amplifiers under warranty do not qualify for this service and are covered under our warranty transfer service. * These fees does not include charges for shipping. If you’re interested in utilizing this service contact us and we’ll be happy to arrange an inspection for you. To see one of our happy customers of this service please click here. 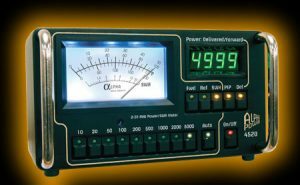 The Alpha Wattmeter represents a revolution in RF power measurement. State of the art integrated circuit technology and innovative design techniques have combined to deliver a mix of features, precision and convenience previously found only in a laboratory-grade power meter. Each meter is individually calibrated over a wide temperature range and the complete HF spectrum. During operation, the 4520 simultaneously measures the frequency of the signal and the internal temperature of the unit and compensates for those factors in determining measured power. This assures linearity in the accuracy of measured power under changing operating conditions. Internal calibration errors are also further reduced by use of proprietary sampling and differencing techniques. The built-in analog meter displays forward or reverse power using nine full-scale ranges from 1W to 5kW. The digital display continuously displays either Forward or Delivered power. All data is available for computer logging through the serial data interface. The analog meter displays power in nine ranges. The full scale reading for the power ranges is: 10, 20, 50, 100, 200, 500, 1000, 2000, 5000 Watts, respectively. These ranges can be selected manually or automatically. The 4510 requires a nominal 12 Volt DC, 600 mA power source. It is shipped with a universal power supply that operates from 85 to 260 Volts AC, 50 or 60 Hz.